The Faithfull Road Measuring Wheel features a large easy-read illuminated digital counter display that offers the user the choice of either a metric or imperial readout and has a memory recall system that allows up to five measurements to be stored during any one use. The digital counter is accurate and easy to use, adding when the wheel is moved forward and subtracting when moved backwards, measurements are simple to store and recall and the counter may be reset at the press of a button. The durable ABS wheel is fitted with a hard wearing nylon tyre and steel axle for a long working life, with a kick stand and a soft hand grip. A telescopic handle allows the wheel to be collapsed for compact storage in the supplied weatherproof carry bag. Suitable for measuring long distances where a long tape becomes impractical. Widely used for road and ground measuring e.g. construction, garden, schools, large open areas. 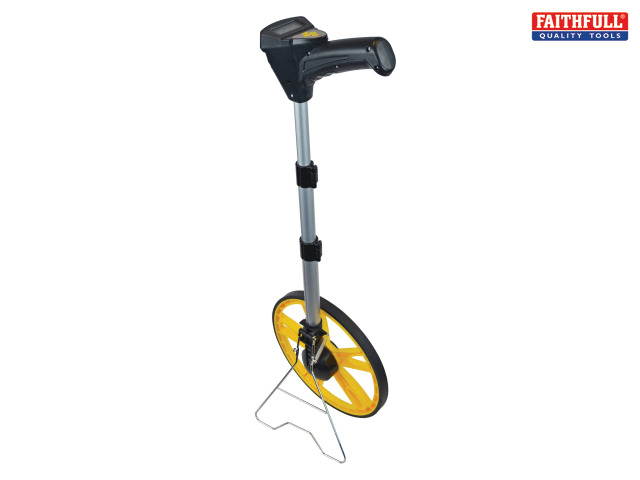 It is a high quality and durable measuring wheel with an accurate digital readout and an ergonomic handle design. Input Power: 3V 2 x AAA LR3 batteries (NOT Included). Size: Closed: 65cm, Expanded: 98cm. Counter: Digital Metric or Imperial. Max Measuring Range: 99999.9 (m/ft). Wheel Diameter: 318mm (1m per wheel revolution). Temperature Range: -10 to 45˚C.